Wasps deputy chairman Nick Eastwood insists that struggling football club Coventry City remain an important part of the Premiership rugby side's successful new life at the Ricoh Arena. Sky Blues fans have been left perturbed by a press release announcing redevelopment plans at the 32,600-stadium, which the rugby club now own. But Eastwood said: "Coventry City are a very important part of our business. "They have a significant number of fans who come. They are very important." Wasps' statement announced a series of planned upgrades at the Ricoh Arena which will "improve access, customer experience and increase footfall". The planned opening of the Ricoh's new railway station in June 2015 will be followed by the conversion of the existing Ricoh Arena Hotel into a Doubletree by Hilton, along with upgrades that, when finished, will offer five bars, three restaurants and 20 other food and beverage outlets. In the official announcement confirming Wasps plan to redevelop the Ricoh Arena Hotel on the stadium site, as well as improving bars, restaurants and matchday food and drink outlets, there was no mention of League One side Coventry - the ground's main tenants since it opened in 2005. Sky Blues fans, having only been back in their rented home for seven months following their season in exile at Northampton, remain fearful that the Ricoh Arena will, one day, be redecorated in black and gold. And some consider that, in the continued fall-out from the club's ugly year-long rent row with the Ricoh's previous owners Arena Coventry Ltd, their future still lies elsewhere. 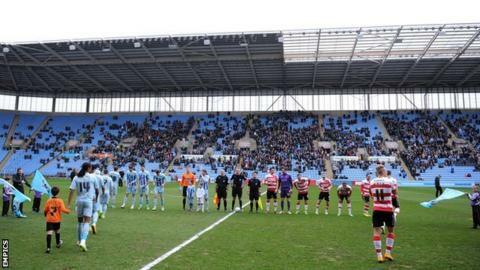 Peter Ward, from the Sky Blues Supporters Consultative Group, told BBC Coventry & Warwickshire: "We are in a pitiful state of affairs as fans of our favourite football club. This is just another reminder of where we are." Offered a chance to respond by BBC Coventry & Warwickshire, the Sky Blues' owners opted not to comment. But Eastwood was supportive of the football club in that respect, suggesting that there is not much for them to say given their current predicament - fighting a League One relegation battle, as well as being only tenants of the stadium. "If I was them, I'd be concentrating on the football side of things," he told BBC Coventry & Warwickshire. "I'm not sure they'd want to be distracted to by conversations about hotels and what things would look like. "I don't think they'd expect to be consulted on that because it's really our decision. Clearly we own the stadium. But it can only be of our benefit to them. All the changes are not in the stadium itself, but mainly in the atrium, largely about the non-sporting side of the business. "We consult very regularly with the Sky Blues, not only with the officials, Steve Waggott (Coventry City's chief executive) and his people but with the fans representative groups. As well as the Exhibition Hall, which can accommodate up to 12,000 for events, concerts and sporting occasions such as Davis Cup tennis, the Arena itself has a capacity of 32,600, increasing to 40,500 for music gigs. "I've spoken to the Sky Blues Trust on a number of occasions and gone to their meetings. We want to be as consultative as we can." Wasps have enjoyed a 50% increase in turnover since moving to the Ricoh Arena in December, having increased attendances by over 500% compared to the gates that they were getting at their previous home in Wycombe. "Our attendances are a fantastic reflection of the amazing reception we've had in the city and the surrounding area," added Eastwood. "I've always thought that the people of Coventry are just very proud of the Ricoh Arena and they went to support anything that helps the Ricoh to be successful in its own right. "We've agreed terms with probably the most famous hotel name in the world. It announces the quality we're looking for and signifies that incredibly important and prestigious brands want to be associated with the Ricoh Arena, and Wasps, and indeed with the Sky Blues too." Nick Eastwood was speaking to BBC Coventry & Warwickshire's Phil Upton.